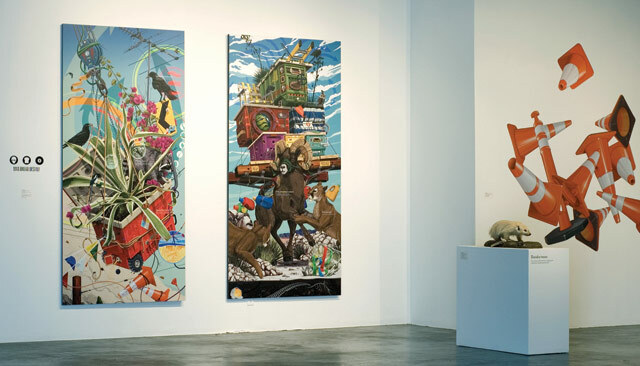 The Contemporary Art Forum’s Call for Entries installation includes Luke Matjas’s Man Bread Destiny series (left). FIVE FRESH TAKES: In the world of visual art, the group show is a tried and true presentational format. Typically there’s a theme, whether it’s a shared subject or an artistic medium, and artists are chosen who fit within it, resulting in a kind of visual smorgasbord. Not so for the Contemporary Art Forum’s annual Call for Entries. The exhibit, on view at CAF (653 Paseo Nuevo) now through October 9, represents the recent work of five individuals chosen by a panel of jurors from an applicant pool of more than 75 artists from the tri counties. There is no overarching theme—at least not an intentional one—only that these contemporary art-makers represent the talent, sophistication, and diversity of art practice in our region. The result is the artistic equivalent of a tapas bar: a series of delicious samples, each with its own distinct flavor. Guest curator Kim Beil worked with the winners over a period of six months, helping them determine the scope of their contributions. One of the artists, Desiree D’Alessandro, didn’t produce a work of visual art at all. Her contribution is housed in a small side gallery, where blackout curtains throw the room into total darkness. The “viewer” of this work becomes instead a listener to a looped soundtrack of short exhalations and a flurry of blows. “A Boxer’s Soundscape: The Battle During and Between Rounds” is an audio recording of the artist boxing. The piece has no physical form, yet it evokes both an image and an intensely visceral experience; this listener found herself twitching as if the punches thrown on the soundtrack sought her own ribs. In the main gallery space, Leighton Collier Roux approaches her subject from two angles. “Embrace” is a video loop in which bare arms encircle a tree trunk. 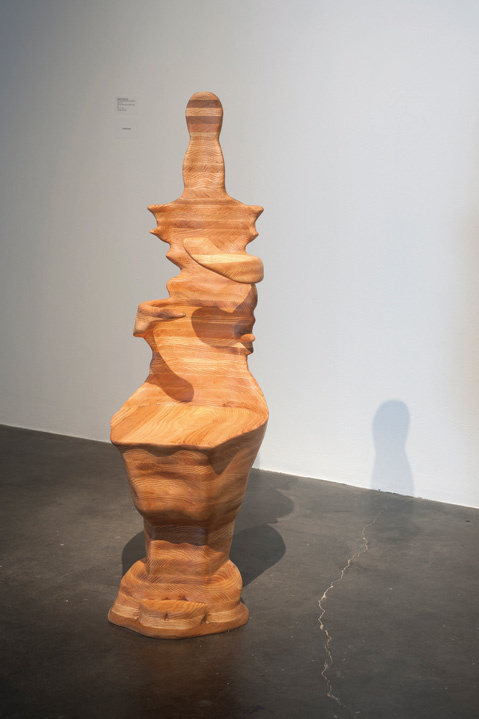 The roles are reversed in “Chair Hold (intermittently occupied by artist)”—a wonderfully irregular wooden chair with arms that seem to squeeze the absent sitter tight. Nearby, Luke Matjas offers a series of works under the heading Man Bread Destiny. His tall, mixed-media panels suggest a civilization on the brink of collapse. In “The Rafting Hypothesis,” a plastic drinks cooler bearing a bizarre array of plants, animals, traffic cones, and garden hoses floats like a latter-day Noah’s Ark above power lines and tree tops. Matjas’s blend of digital and analog drawing yields dense scenes full of finely wrought detail, at once compelling and disturbing. Like Matjas, Michael Powell combines digital and hand techniques in his Myth/Medium series, in which rainbow-hued digital prints mounted on wood are obscured by layers of paint and plastic. Meanwhile, Elizabeth “Bessie” Kunath’s hulking, fleshy forms are made from chicken wire draped in papier-mâché and cheesecloth. Some hug the floor like clumps of sodden earth. Others hang heavily, like clothes stiffened from years of accumulated grime. SEEING THE INVISIBLE: Julika Lackner has for a long time been interested in painting what can’t be seen, or at least that which is hard to represent. Air, light, mist, and the effects of great distance thus form the basis for her visual investigations. In her most recent Afloat Series on view at Arigato Sushi (1225 State St.) through October 29, Lackner delves further into the territory of the abstract, conjuring imagined atmospheres of wispy vapor and particles of light. In fact, this show gives a sense of her recent trajectory: the largest works, hung high above the restaurant floor, are also her earliest. “Flying High” (2006) and “Turbulence” (2007) feature the Earth as seen from an airplane window, shrouded in clouds. In more recent works such as “Following Sea” and “Underway,” both from 2010, there’s a hint of horizon, a glint of sun, yet a band of oblong flecks spans the lower register, like a key to the code of the artist’s color palette. The same flecks recur in her latest works such as “Afloat Series (Orange/Turquoise)” (2011), where in fact they dominate the canvas. It’s as though Lackner sees something most of us don’t, like a child who stares at the sun, then squeezes her eyes closed to watch the specks of light that dance through the darkness. To learn more about the artist, check out julikalackner.com.